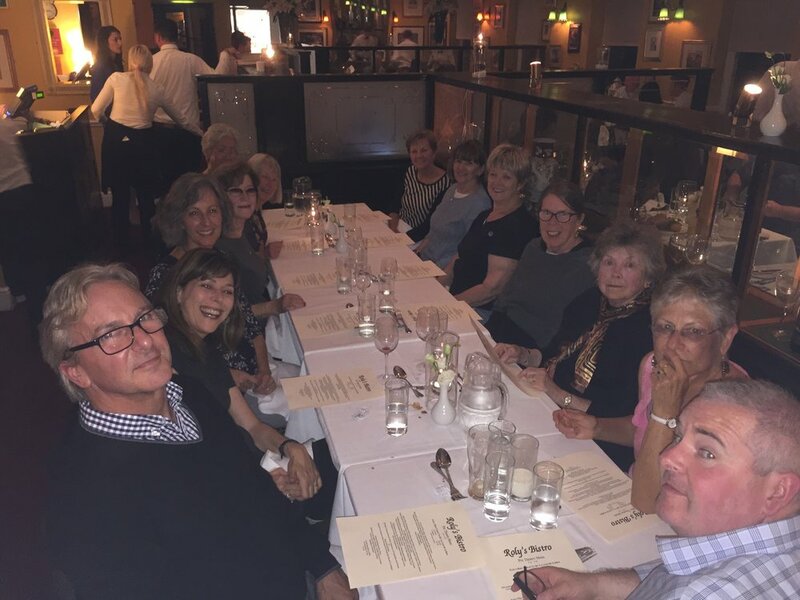 Last night we had our farewell dinner one night early as a few group members were going to out all day finding their ancestors in a small village 3 hours outside of Dublin. We toasted each other and talked about the 2 week trips highlights. This trip was filled with many visits to different parts of Ireland and Scotland to get an introduction to the countries since this was our first Anywhere Art workshop to these countries. We were so impressed with what we saw that we already have a return trip planned for next April 2017. (See the page under European tours on this website). The dinner was held at Roly's, a traditional Irish bistro in the heart of Dublin. It's always sad to see a wonderful workshop end and say good bye to new and old friends. Many friendships have been made on our trips and I know we will stay in touch and many of us will continue to travel together. Everyone enjoying the dinner. On the right is Owen Flynn, our knowledgable driver and guide. He made the history of Ireland come to life for us. Everyone at the other end of the table enjoying themselves at Roly's.